It’s a celebration of Independence with the new Celebrate Scentsy Warmer, our June 2016 Special. These fireworks cast a beautiful scene, each side depicting a different view of the festivities. 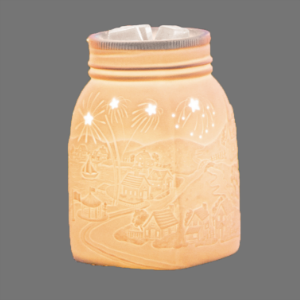 The panoramic scene of the Celebrate Scentsy Warmer showcases an epic four-sided display with star shaped peek holes that appear to be bursting overhead in the fireworks. The translucent, etched ceramic jar depicts the charm of small town celebration; complete with a waterway, sail boat, community church, trees, and houses. Start the party by flipping the switch, adding 4-5 cubes of Scentsy wax, and enjoying the ambiance of pride, fun, family and friends. Celebrate Scentsy Warmer is 7.5″ tall and comes with 3 pieces, including the beautiful Celebrate etched jar, electric Scentsy warmer square base, and a 25-watt light bulb. This warmer does not have a separate dish, as the jar itself is all one piece, with the dish built in at the top. 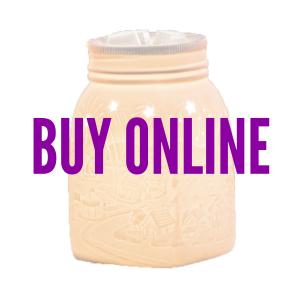 Click here for our current Scentsy Warmers.